As you may be aware, Prince Harry and American actress Meghan Markle are due to marry on 19 May 2018. If you are looking for activities to celebrate this event, here are a some royal-, wedding- and patriotic-themed ideas to get you started. Use the club camera to take photos of the wedding guests as they pose inside the picture frame. Make some popcorn confetti. To make the popcorn confetti suitable for a Royal Wedding, use white mini marshmallows, red and blue 'millions', and love hearts. Make marshmallow pops. To customise them for a Royal Wedding theme, add red and blue food colouring to separate bowls of white chocolate, and use red, white and blue cake decorations and small sweets. 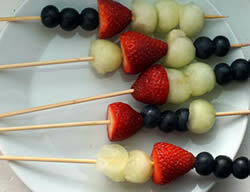 And if after all that sweetness, you are craving something fresh and healthy, why not make some red, white and blue fruit kebabs? Obviously finding blue fruit is a bit on the tricky side, but you can get the overall effect by using blackberries, blueberries, and black grapes (for blue), together with strawberries, raspberries, and watermelon (for red) and banana, honeydew melon, and peeled apples (for white).